All is well, so OBO is calm and happy. In this case, OBO runs a budget deficit of N9m but carries a debt burden of N4m. The following year, OBO now earns N20m, but since he doesn’t need a car, he moves to a bigger place that costs N4m and buys his baby Girl a N3m engagement ring. He still spends N1m per month so he can drink at Sip and post pictures on Instagram, and also spent N1m repaying part of the bank loan he took. You can see that earning more money cannot be a bad thing; OBO now has a zero deficit budget, but owes N3m. According to the previous government, the FGN expected to earn N3.7 trillion in 2015 and spend N4.6 trillion; like OBO, this means it needed to borrow N900 billion to fund the deficit. However, the government is already owing N11 trillion, so the additional deficit of N900 billion will now take the government’s debt to N12 trillion. How Did We Get To N7trn? Ministries can duplicate costs, especially with the Finance Ministry.At first glance, you can see contractor payments account for over 50% of the total amount. Interestingly, the widely circulated interim report of the Transition Committee estimated N800bn was owed to contractors. However, as my sauce says this estimate was revised, using numbers submitted by the ministries in their handover notes. These were the numbers submitted to the Transition Committee in the handover notes. The outgoing government did not provide any ageing on the debts. That is, it is not yet known how old these liabilities are. This will determine how contractors are paid e.g being issued bonds to receive their payments in 24-36 months time when Nigeria’s finances are hopefully healthier. A detailed list of the contracts was also NOT provided so it is possible that there is some double counting going on in the above numbers. Some of the balances may also be disputed and some contracts may be cancelled or terminated. No documentation was supplied to show whether the contracts were executed to specification. So, now we know where the figures have come from, we need to answer the second question; is this debt or deficit? The position of the Government seems to lean towards an urgent need to clear these obligations within one budgeting period for a number of reasons. I heard one contractor laid 4,000 casual staff off, because he was being owed billions of Naira and unable to pay salaries. Therefore, the government believes paying contractors will not only keep people in jobs, it will reflate the economy, and ensure outstanding projects are completed. Also, paying outstanding cash calls to oil companies is important if Nigeria wants to develop new fields, especially for the much-needed boost in gas supply. The other issues like salary payment, subsidy arrears and the North East redevelopment plan are immediate needs that need to be funded. Remember, the country already owes N11trn and if we need to borrow N7trn more, it will take our total debt exposure to N18trn – roughly 18% of GDP. So, to answer the second question, the APC Transition Committee is suggesting if the FG writes a new budget today, it will show a deficit of N7trn, which could increase Nigeria’s debt to N18trn, depending on how the deficit is financed. While our debt/GDP ratio is not bad compared to similar countries, the real problem might occur when we work out how to pay these debts. Currently Nigeria spends over 20% of its income servicing debts; if we add another N7trn in fresh debt, this could mean we will spend over 30% of our revenues paying creditors. Now, imagine OBO spending 30% of his next year’s income to pay his debts, it means things like champagne at Sip and that fancy apartment must be removed from his expenses. For Nigeria it means a lot of non-essential expense lines must disappear: fuel subsidy, huge legislative costs, bloated workforce etc. If the three things noted in the caveat to the contractor debts above happen, the FG might reduce contractor debts from N4trn to N1.5trn (nothing suggests this is possible, but we are allowed to hope and pray a little). 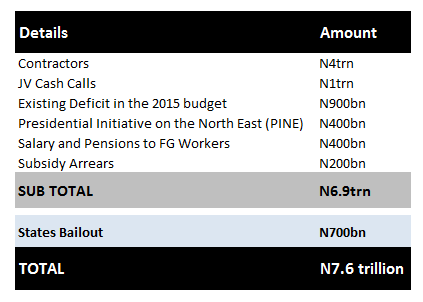 If this happens, the deficit will drop to N4.4trn. Not bad, but still needs some work. This is where yesterday’s post on Mr Wang is very useful. Imagine we have our own Mr Wang, who can either get corrupt people to lose their ill-gotten wealth through a transparent legal process or just come to submit those assets after being shown what a prison cell looks like. BUDGET SUPPORT FACILITY: The government can take the planned budget support facility from the World Bank and African Development to shore up its funding gap. This facility was originated by the previous government, but I was told the lenders stalled on disbursement till the new Government was in place. NLNG Dividend: The NNPC claims the committee working on the alleged unremitted dividend from the Nigerian Liquefied Natural Gas Company. The Inter Ministerial Task Team has operated like a cross-breed between a tortoise and snail up till now, maybe the arrival of a new sheriff will quicken this reconciliation. Securitization: The government can release cash by pledging a portion of future payments from guaranteed revenue sources. For example, the government could pledge a share of guaranteed revenues from annual operational levy paid by GSM operators; dividend and taxes from NLNG; and a percentage of NNPC’s share of crude oil sales (remember those 445,000 barrels sent to domestic refineries?). Since these are guaranteed revenue streams, lenders will be quite pleased to provide debt upfront. Sale of Equity in Selected Assets: I’m no expert but those who know suggest NNPC/NPDC stake in those JV assets might be worth about $30 billion. The Government can sell 20% of its stake to investors and host communities to raise immediate revenues and also reduce the FG’s future cash call burden on these assets. Fiscal Responsibility Act: Section 21 Section 21 of the FRA states that: “Notwithstanding the provisions of any written law governing the corporation, each corporation shall establish a general reserve fund and shall allocate thereto at the end of each financial year, one-fifth of its operating surplus for the year.” Of course, most of the MDAs pretend this Act was never passed and continue to keep their surpluses in Ghana Must Go bags. If enforced, MDAs like CBN, NIMASA, BOI, NPA, TETFUND, FAAN, JAMB and WAEC can add some “change” to Government’s coffers. The options above can yield N5trn. But then, this is all on paper and reality will be far harder. The above was sent to me by a mysterious sauce. I don’t even know how they got my email address but here we are. It’s a useful summary of where Nigeria currently is financially and where it needs to go. What If Mr. Wang of The CCDI Comes For Your Daddy? Many thanks to the sauces that feed us all these exclusives. But why is education owing 1.2 trillion Naira? Have they resumes feeding undergraduates with a full chicken a day? And even Aunty Ngozi is owing almost 500 billion naira! Who is she owing? What services does finance ministry contract out? See ehn, I’m just tired of seeing all these big numbers. Thanks and thanks so much for your idiots guide to understanding the world of corporate /government finance! Before all the other ifs and when’s Mr Wangs option seems best IMO. Grazie to the sauce(s), but honestly what is the Finance Ministry actually financing? The analysis make Health Ministry look like it’s not well funded. The President must try and WANG off our money from the rogues o…that figure look yummy even if it will put people in prison. Thanks to the “sauces”. What sort of contracts is the office of the SGF giving out? I find this person’s approach to explain normally hard to grasp concepts very refreshing. Another excellent article; commendations are in order. I look forward to the next delivery. Great guide to becoming a Wangous President – For Beginners…Thanks. 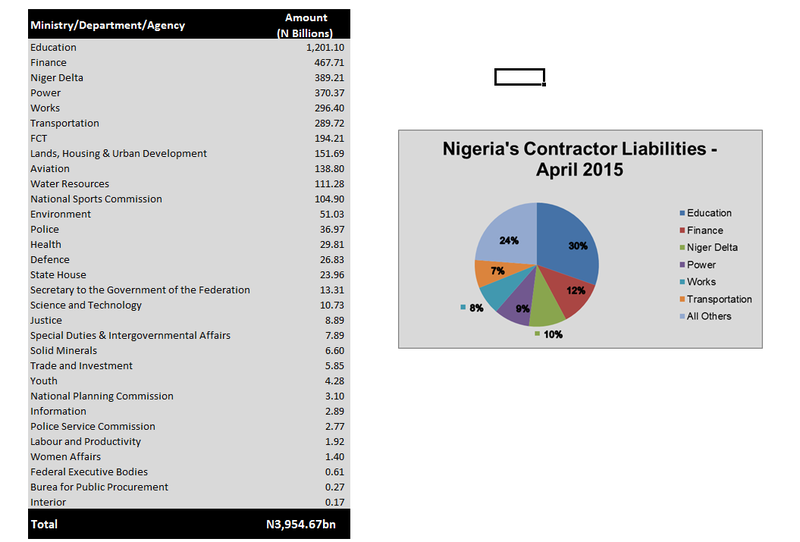 Well, one thing about the contractor debts is that we do not know how long they have been carried over but I do think there was an attempt to substantially reduce contractor debts during the OBJ era. As mentioned, the actual figures should be lower and not everything submitted by MDAs can be trusted. The Buhari administration certainly has a lot of work on its hands. Is this the N7/N8Trn the VP is referring to in his new budget? I am hoping you can consult on your Sauces for the funding insight for the 2016 Budget, they are still reliable right? I will be expecting an article providing the budget outlook and implications while richly citing various similarities with Communist China. Economically, 2015 has been a forgettable one for Nigeria. Your guys have been there for 5 months and still have no economic direction, other highlights include the refusal of the naira devaluation, the continued subsidy payments, and the delisting of Nigeria from the JPMI . “There is a tide in the affairs of men which,taken at the flood, leads on to fortune” Hit the ground running? Hopefully 2016 will provide more clarity.